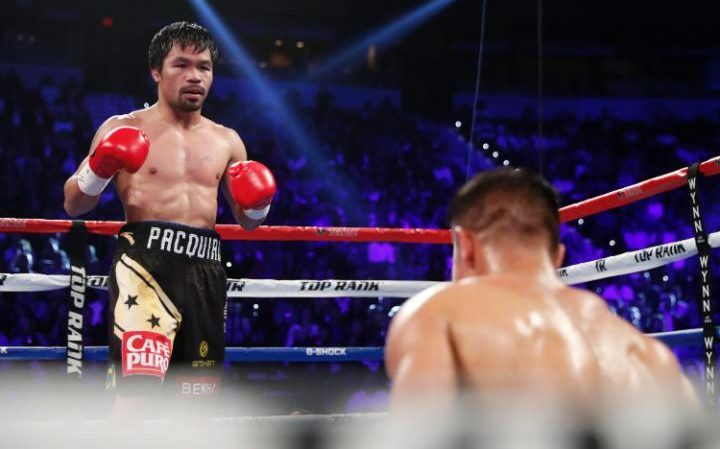 Manny Pacquiao produced a crowd-pleasing but imperfect display to win the WBO welterweight title on Saturday night, taking the belt from Jessie Vargas thanks to a unanimous points decision at the Thomas and Mack Center. Pacquiao won 114-113 on one judge’s scorecard, and by a runaway margin of 118-109 on the other two. With both men committed to offense, a scrappy but entertaining brawl ensued, but Pacquiao’s superior hand and foot speed meant he always looked likely to come out on top. The Filipino superstar claimed the only knockdown, decking Vargas with a hard, straight left hand in the second round. With Floyd Mayweather having arrived to sit ringside around 15 minutes before the main event, rumors immediately began to circulate that a repeat of the much-hyped 2015 contest between boxing’s two biggest names was in the works.